MM is considered to be treatable, but only for a period of time. While the use of proteasome inhibitors and stem-cell transplantation significantly improves patient survival, in the natural course of the disease patients relapse and become refractory to chemotherapeutic agents. As the incidence of MM continues to increase, there is a large impetus for researchers and clinicians to develop novel, curative therapies for relapsed and refractory MM. The long road toward delivering a curative MM therapy to the clinic begins with the identification and characterization of novel therapeutic targets that are critically involved in promoting plasma cell growth and survival. Targeting surface antigens of malignant plasma cells such as TACI, CD138/Syndecan-1, CD38, and SLAMF7/CRACC have been pursued in both preclinical and clinical settings. Expression of these antigens, however, is not solely restricted to the plasma cell lineage, an attribute that may ultimately limit the therapeutic efficacy of agents targeting these antigens. One antigen that has garnered significant attention as a more selective therapeutic candidate is B-cell maturation antigen (BCMA/TNFRSF17/CD269). BCMA is a transmembrane protein belonging to the TNFR superfamily and is almost exclusively expressed on the surface of plasmablasts and differentiated plasma cells. Upon engagement with its cognate ligand produced by accessory cells of the bone marrow, a proliferation inducing ligand (APRIL), BCMA transmits survival signals that are critical for the maintenance of long-lived bone marrow plasma cells. While BCMA plays an important role in normal plasma cell physiology and thus supports the humoral immune response, it is aberrantly overexpressed on the surface of malignant plasma cells in the bone marrow of MM patients. In MM, the APRIL-BCMA signaling axis of malignant plasma cells is sent into overdrive, which supports their robust growth, evasion from apoptosis, and production of potent immunosuppressive molecules such as IL-10, PD-L1 and TGF-β. 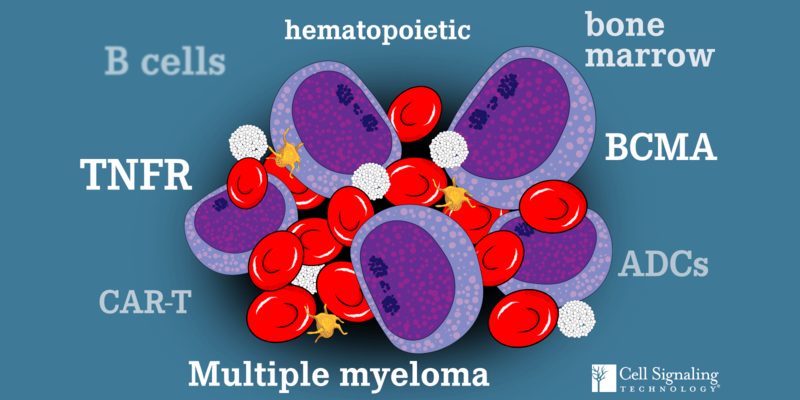 Given that BCMA drives the survival of malignant plasma cells and its expression is largely restricted to the plasma cell compartment, this molecule is positioned as a critical node in the pathophysiology of MM. As a result, targeting the APRIL-BCMA signaling axis has been a high priority in the immunotherapy universe in recent years (1). Indeed, novel immunotherapeutic-based approaches are being aggressively pursued to eradicate malignant BCMA+ plasma cells that overwhelm the bone marrow of patients with relapsed and refractory MM. Antibody-drug conjugates (ADCs) and autologous chimeric antigen receptor engineered T cells (CAR-T) targeting BCMA have emerged as potent weapons to blaze a trail towards a cure. As a testament to the profound early success of these agents in the clinic, the US FDA granted Breakthrough Therapy Designation in 2017 to GSK for their anti-BCMA ADC (GSK2857916) and to Celgene/Bluebird Bio for their anti-BCMA CAR-T therapy (bb2121). The 2017 FDA approval of two CD19-targeted CAR-T therapies for B-cell malignancies dramatically escalated the hype surrounding CAR-T immunotherapy. While the FDA approval of BCMA-targeted CAR-T for MM is a very real possibility, more studies are required in order to deliver this therapy to the clinic. This is momentous time for MM patients that instills a renewed sense of hope. As the repertoire of immunotherapies and combinations thereof grow (adoptive T cell therapy, checkpoint blockade, mAbs, and vaccines) so does the potential for a cure.